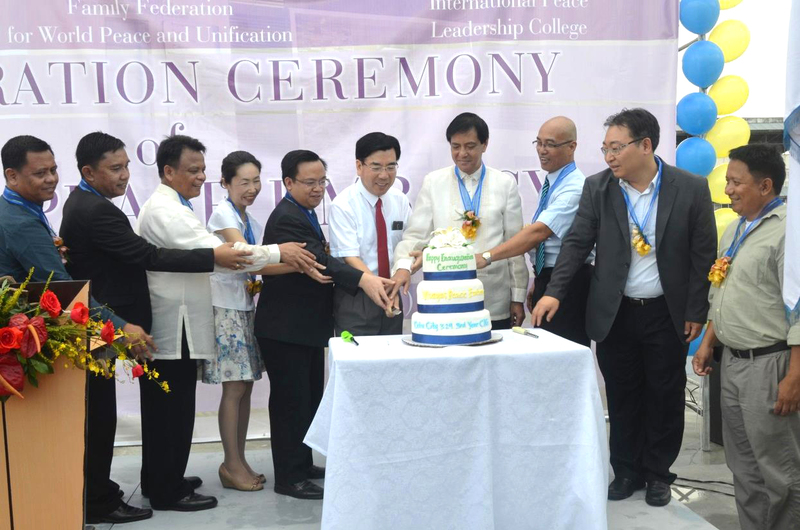 FFWPU Philippines: A newly constructed 3-storey Visayas Peace Embassy located in Cebu City, Central Philippines was inaugurated on the 29th day, 3rd month in the third year of Cheon Il Guk (May 17th 2015). Elders, leaders and members from all over the Philippines gathered for the ceremony together with Dr. Chung Sik Yong, Special Emissary and Continental Director for Asia, the National Leader and CIG Special Envoy Rev. Julius Malicdem and Honorable Michael Rama, Mayor of Cebu City who led the ribbon cutting ceremony. This momentous event marked yet another important milestone in the history of True Parent’s footprints in the second daughter nation, Philippines. The heartfelt gratitude and excitement of many brothers and sisters filled the grounds as most of them coming from various places in the Visayas regions, saw for the first time the modern designed, three-storey structure built on the land which was purchased in 1980’s through the investments of hardwork and sincerity by the early members of the Philippine church. In spite of the summer season and for many days of hot weather, on that early morning of the inauguration day, strangely showers of rain fell from heaven as if sanctifying the whole building. The ceremony started with the tearful prayer offered by Dr. Yong to dedicate the new facility before Heavenly Parents and the True Parents of Heaven, Earth and Humankind. This was followed by the ribbon cutting and the unveiling of the dedication marker. 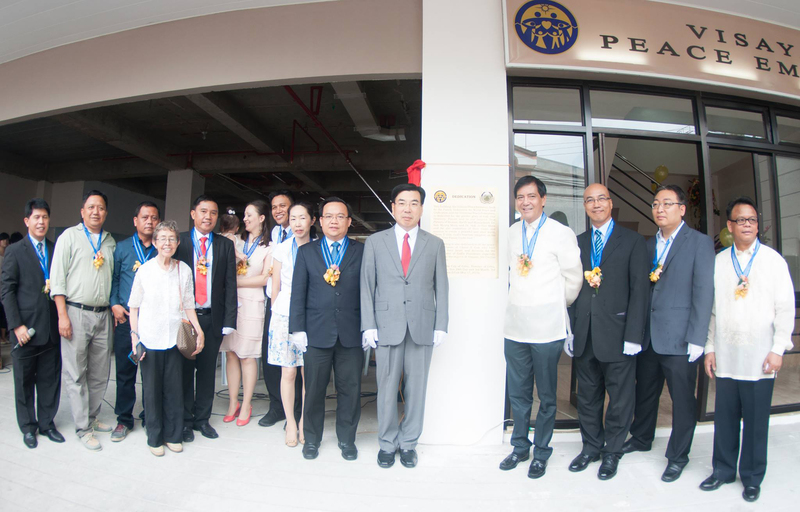 The new building which shall be known as the Visayas Peace Embassy was truly a blessing from True Parents and a great motivation for the Philippine Movement to continuously offer devotions and sincere efforts to advance Vision 2020 towards the realization of Cheon Il Guk. After the ribbon cutting, the whole building was sanctified with Holy Salt after which the members then gathered for a program at the roof deck. The program began with the members offering Kyungbae and flowers to True Parents and followed with the cutting of the celebration cake. The Philippine National Leader and CIG Special Envoy, Rev. Malicdem, gave the opening remarks. In his message, he recognized the early members in the Philippines who have worked hard to purchase the property in Cebu where the Peace Embassy stands. He also narrated the great vision and motivation of Dr. Yong who challenged the members to take ownership for the sake of the restoration of the Philippines to become God’s nation. He also acknowledged the supreme sacrificed of those who offered their lives during the strong typhoon that hit the central regions in the Philippines towards the end of 2013. The province of Cebu was one of those areas severely damaged by typhoon Haiyan that time. An accomplishment report by Engr. Felix Sanchez and a video presentation followed. Then Cebu City Mayor Hon. Michael Rama, who is a staunch supporter of the Movement in Cebu since the nineties, gave a very animated message and emphasized the value of living for the sake of others and which is the greatest asset of our Movement. During the main address delivered by Dr. Chung Sik Yong, he emphasized the value of vision and faith. He urged the Philippine leaders and members to offer their absolute best for the attainment of the dream of True Parents and the value and significance of being able to attend with them. He said, “Our beloved True Parents came to establish the sovereignty where Heavenly Parents can dwell, starting with the True Parents and flow down to you our blessed central families. As filial children of True Parents and loyal patriots of this nation, don’t we have a natural desire to offer a place where Heavenly Parents and True Parents can call their own?” He further stressed that having received such tremendous blessing from True Parents, the more that Philippine members need to offer more hardwork and sacrifice especially for the victory of witnessing and tribal messiahship especially that True Father have emphasized about this in his last prayer.. Dr. Yong added in the end that the new Visayas Peace Embassy should become the center of resurrection and tribal messiah activities in the regions in central Philippines. After his speech, flowers and a gift for True Parents were presented by the couple of the Regional Leader in Central Visayas Region, Cesar and Evgenia Juanillo. Part of the gathering was also the awarding ceremony for the recipients coming from Visayas for the Cheon Il Guk True Parents Award which was given during the 3rd Anniversary of Foundation. Dr. Jaime Vergara, FFWPU Vice President, who served as the emcee for the ceremonies then called on Dr. Venus Agustin, the President of International Peace Leadership College, to lead in the offering of cheers of eog mansei as a fitting conclusion for the great victory offered to heaven! As a daughter nation, the Philippines is determined to step up to its role in God’s providence in the era of Cheon Il Guk and continue to march forward towards Vision 2020. Mabuhay!